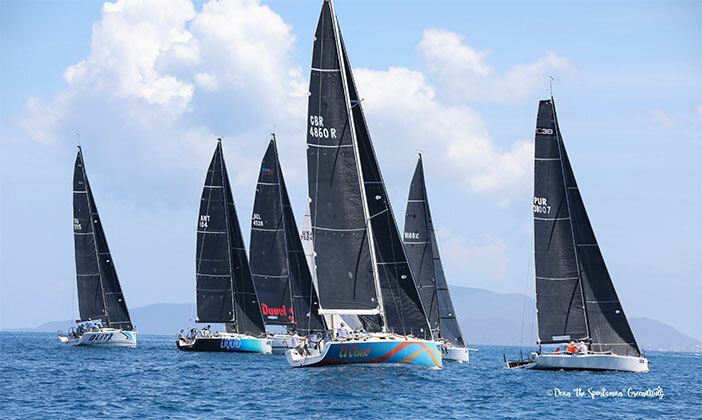 Visitors sailors from 16 countries on 90 different boats, were expected to drop around $5 Million in the territory’s economy, during the 48thBVI Spring Regatta and Sailing Festival that wrapped up Sunday with a prize giving in Nanny Cay, after four days of racing over six days. Phillips said that Saturday, it was obvious that it needed to be a beach day in White Bay and a wonderful tour around the BVI. With no wind and races cancelled, Phillips said they had boats going over to Anegada, Jost Van Dyke, Salt Island, the Willy T and he even had lunch at Cooper Island. In explaining why races were cancelled on Saturday and not on Sunday, despite similar conditions, Brennan who has been head of the Race Committee for the last 18 years and ran events in the 1996 Atlanta Olympic Games as well as several Sailing World Championships, said after visiting Sage Mountain, it looked thin and flat, with a lot less wind early on Saturday. Phillips said that under the gun on Sunday, the Gods looked down, grinned a bit and they had enough wind to get some good racing in. Henry Leonnig’s Fire Water won the Best BVI Boat, after winning Racing 3, with 7 points. Dr. Robin Tattersall at 88, the oldest competition, won Bareboat 3 with five points.